Vue32 / Summer12 Wins 2017 Deal Of The Year Philadelphia Business Journal: "Best Real Estate Deals: The projects, people & companies changing the landscape"
Transposed from a Philadelphia Business Journal Article published by Natalie Kostelni March 23, 2018. Philadelphia is awash with multifamily family projects. They’ve spread across every neighborhood and as a result it can be difficult to notice when something distinctive comes out of the ground. Such is the case with Vue32 and Summer12. The $60 million development at 3201 Race St. and 3200 Summer St. in Powelton Village rose on a vacant corner on the Drexel University campus. It involved constructing a 16-story building with 164 apartments, a 180-student preschool, and soon 12 for-sale townhouses. While those details at first blush sound like a typical mixed-use development, Vue32 and Summer12 strove to be anything but and because of that and the challenges it overcame getting started, it has been named the Philadelphia Business Journal’s Deal of the Year. University City has been experiencing a tremendous amount of development activity during the last 20 years. Despite that, no large-scale private real estate investment had made its way north of Race Street until Vue32 was proposed and ultimately completed. When Drexel issued a request for proposals for the development of the parcel at the corner of 32nd and Race streets, the university had several goals in mind. It wanted to find a way to increase homeownership in the community, provide new housing for faculty, staff and graduate students and make available a preschool that would cater to not only those who attend or work at Drexel but people in the community as well. The university selected Radnor Property Group to oversee the project’s design, to build it, finance it and own it in an arrangement in which Radnor has a long-term ground lease with Drexel where Vue32 is located. This arrangement can bring its own set of challenges. “Public-private partnerships can make things complicated because of the wants, needs and interest of each,” Fahey said. The property had its own set of issues. The final site involved combining 12 different properties and, as an assemblage, the parcel was bifurcated by two different zoning designations. Rather than agreeing to change the zoning through an ordinance, Radnor Property first engaged the community and pushed for a variance, said David Yeager, who formed Radnor Property in 1999. “In that process, we had 14 different zoning variances, which I have never had to do before,” Yeager said. It took six months to go through the community engagement process and Radnor Property worked with District Councilwoman Jannie Blackwell’s office on that front. The project also went through several different designs as Radnor Property worked with the Powelton Village Civic Association to address community concerns. There were many. The civic association worried about the influx of students living in the neighborhood. It’s a family-oriented community and Radnor Property committed to not renting the apartments to undergraduates but primarily to graduate students and young professionals instead. The civic association didn’t want surface parking and didn’t want to have the development obstruct the natural light of a nearby community garden. To solve those issues, Radnor Property moved the bulk of the building as far east on the site as it could, extended a western plaza to respect the garden and create a more light and air, increased the building height, and buried the parking below the ground. To accomplish Drexel’s goal of boosting homeownership, the university sold a parcel to Radnor Property where it is developing the 12 townhouses. The design of that part of the project was also taken into consideration to respect the scale of the neighborhood. The townhomes are each four stories and, as a grouping, was designed to be a transition from the 16-story tower to the lower-scale neighborhood. 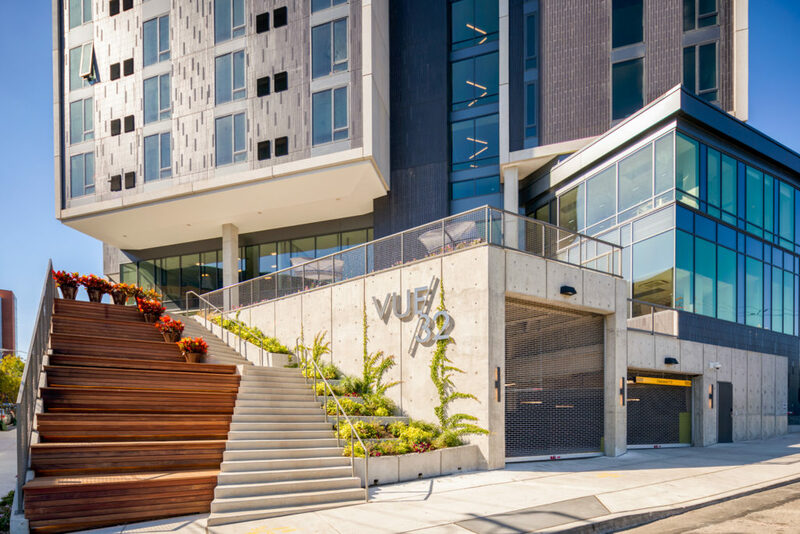 Construction of Vue32 was completed last summer and the project is more than 50 percent leased and that’s within the developer’s projections. Because of its location in University City, the majority of renters are Drexel faculty and staff and young professionals working at Children’s Hospital of Philadelphia, the University of Pennsylvania and other nearby institutions. A small percentage of residents are those who commute to New York. Work on the foundation for Summer12 is just getting underway and the townhouses are priced to sell for between $375,000 and $450,000.